Welcome to the Peppy Panda classroom! Let me show you around! When each child arrives in the morning, they switch their attendance magnet in the hallway. Then they enter the room, greet the teacher, and begin their Sight Word Path. This is a sneaky way to monitor them as they review their Sight Words each day! After the Sight Word Path, they put their items in their cubbies (labeled to help them remember where to put everything!). Then they grab a journal page and sit down. 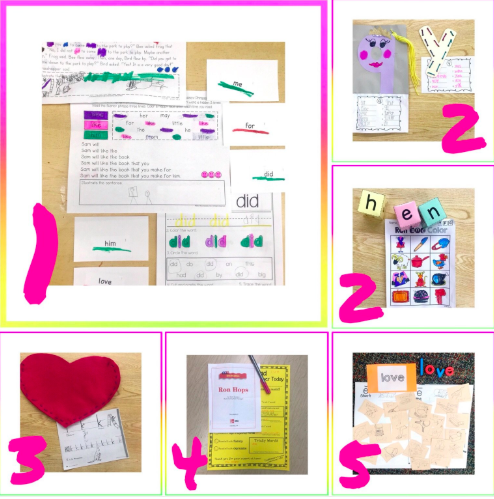 (The writing checklists above are from One Sharp Bunch) After they finish their journal page, they clip it into their journals and sit down with a Library Book. When it’s time for Morning Meeting, we put the library books away and get started! 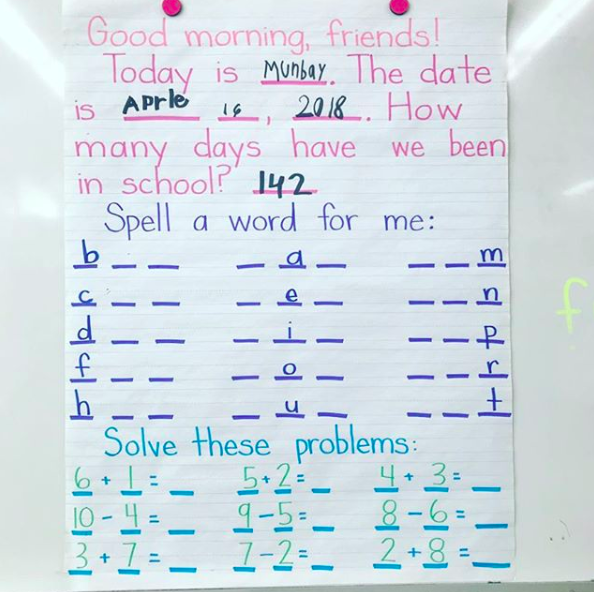 If we do Morning Message (usually second semester), I simply tear off the giant sheet and post it to the bottom of the board using magnets. This still gives the children a chance to write on it, but it can be easily removed so we can use the board for other things, too! During the first last Morning Meeting of the month, they "apply" for their new classroom job. They used to switch jobs each week, but it was difficult for them to remember who was the new Door Holder, or who needed to be turning out the lights? So they voted to keep the same job for a whole month. 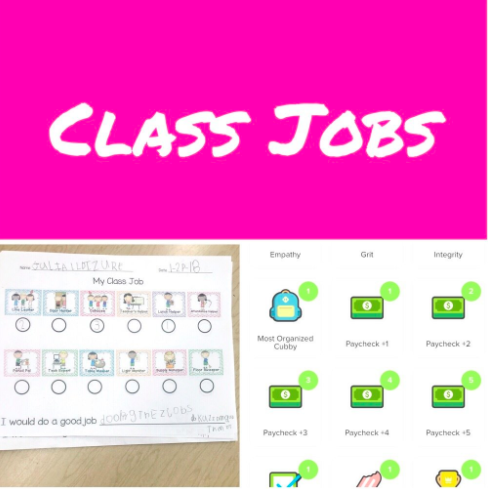 Now they fill out a monthly "job application" and get "paychecks" (Class Dojo Points) every Friday. On Friday mornings, they bring their Class Dojo hundreds charts to the carpet. I pull down the projector screen and display their Class Dojo points, and they fill them in. Then we talk about who earned what special privileges for the upcoming week! Every day is a little different, but we usually do Morning Meeting, Calendar Math, and Everyday Math during this time. Then it’s time for snack and recess! After recess, we start with a quick Open Court reading lesson and then jump into workshops. We post all of our current sight words and other skills on the whiteboard. At the end of the week, we move the sight word to our word wall on the cabinet doors. At the end of the month, we move our writing skill to our Writing Checklist near the student tables (where they write their journals every morning). When it’s time to explain workshops, the teacher helper and supply monitor take turns bringing the workshop buckets to the middle of the carpet. 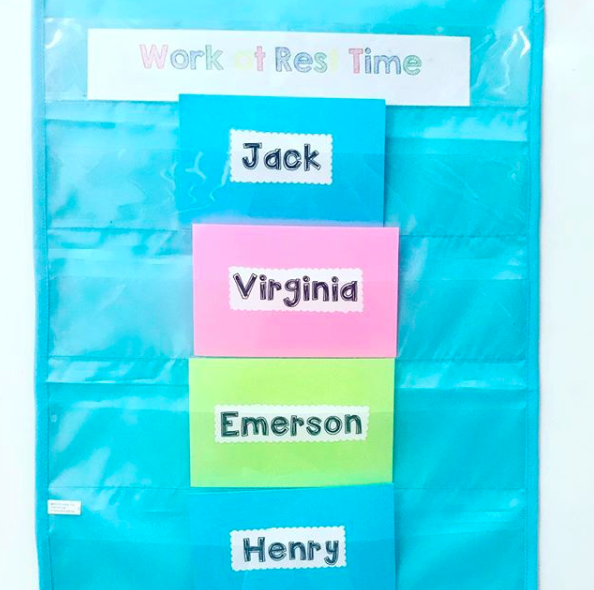 On the white board, we also have a turquoise pocket chart from Target where children can “sign up" to spend extra time working with the teacher. Believe it or not, they actually watch this board like hawks so they can add their names when a spot opens up! The children then split up into their different workshop rotations, one of which is individualized instruction at my teacher table. You can read about that here. As each child finished his or her work, they either place it on the drying rack in the hallway, or in their “take home” basket in their cubbies. If they don't finish, they put in the Ketchup Basket. When a child adds something to the basket, he/she puts a name clip on the edge so it's easy to see who has catch up work! 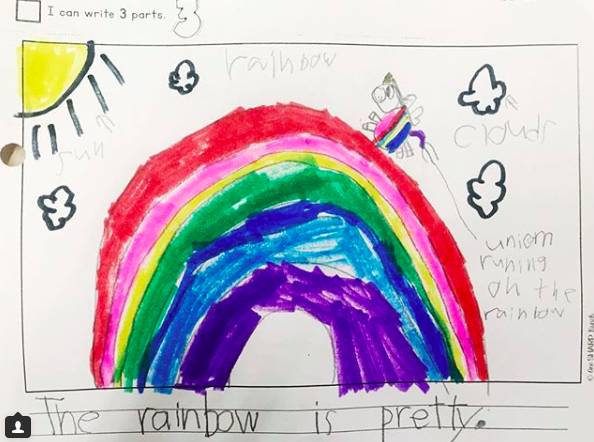 On Thursdays, I hand out our weekly Parent Communication Folders to the children, and they go file their own work into the folders. Then they put it in their backpacks so it’s ready to go at dismissal! After workshops, we clean up our classroom and prepare for lunch, specials, rest, and second recess. Afternoon is usually the time we get last minute emails from parents about changes in transportation. We make sure that each child’s clothes pin is clipped onto the correct method of transportation. We also keep a schedule of our after school “enrichments” by the door, so we can keep up with who stays after school for what. That’s basically a tour of the Peppy Panda classroom and how everything is used!